Never am I so lucky that I get a perfect product on the first try, let alone from a pattern idea that exists only in my mind. I wanted to make a cap that was simple but delicate. I chose a super soft yarn in a snowy cream color. The back starts as 3 dch clusters as the cap increases. 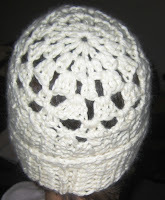 The outside of the cap is ribbed dch that I made extra long so it could be flipped up. 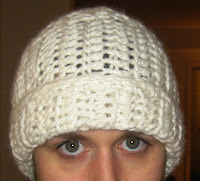 This one is called the Lady Jadie Snowy Ski Cap.